Pre-grant valuation and testing work is really an extension of the TSR award design stage. Once a client has narrowed the universe of possibilities down to a specific design, our work is framed (at most) by a few alternatives. For the specific chosen award we first measure “at-the-money” fair value or “par” fair value. That is the fair value we would observe if the grant date lines up with the performance period commencement date. In this case, at-the-money fair value is not impacted by actual intra-period performance – it is driven solely by the intrinsic characteristics of the award and the parameter space of the client company and the comparator ompanies. Therefore, it does not change dramatically over time. 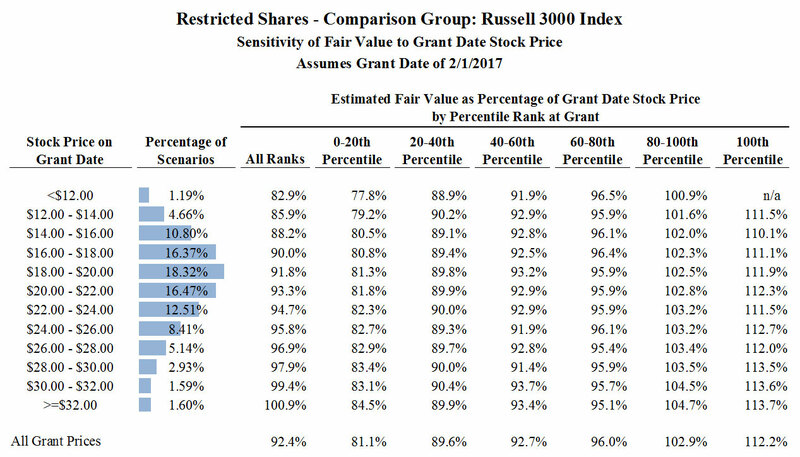 If the pre-grant at-the-money fair value is measured at 94% of the stock price or 105% of the stock price then it will always be roughly 94% or 105% of the stock price, respectively. Changes in volatilities and correlations will result in only minor changes to at-the-money fair value of these awards over time. However, many companies grant intra-period which introduces fair value volatility that is important to understand either from the expensing perspective or the grant-size perspective. To gain the requisite perspective compensation committees and senior management need more than a fair value point estimate. The following chart shows how fair value can materially change between a January 1st performance period start date and a February 1st grant date. The February 1st fair value could run from roughly 78% of the stock price to roughly 114% of the stock price. So clearly a grant intra-period introduces fair value uncertainty or volatility either (A) on the P&L if the granting policy is share-based or (B) for the award recipient if the granting policy is value-based. Suppose the company uses a share-based (or unit-based) approach awarding a participant 5,000 shares (or units). Further, suppose the stock price is ranging roughly between $20 and $22 in late December, and the grant will be made on January 1, the performance period commencement (without any TSR price-averaging prior to January 1). The grant date fair value is roughly 93% of the stock price for this at-the-money award. Even if the stock price moves out of the $20 – $22 range, the 93% ratio will generally be reliable. However, suppose the company grants on February 1st and the stock price still remains in the $20 – $22 range. The Index component grant date fair value (which is now intra-period) could range from $82,000 to $123,000. And if the stock price moves out of the $20 – $22 range the fair value volatility could increase. Of course the company could use a value-based approach of awarding $100,000 worth of shares (units) based on the grant date fair value. This stabilizes fair value on the P&L and Proxy but generates material uncertainty for the recipient with regard to the number of target shares granted. FAS Solutions works with clients to fully understand the uncertainty of intra-period granting as well as defining uncertainty-mitigating courses of action.